Decked in red, green, and yellow, supporters of Sierra Leone’s biggest parties wrapped up their campaigns this week, before general elections on Wednesday. Up for grabs is the presidency, parliament, and local council positions. Current President Ernest Bai Koroma of the All People’s Congress party must step down after serving two terms. The APC’s new flag-bearer, ex-foreign minister Samura Kamara, faces challenges from opposition stalwart Julius Maada Bio of the Sierra Leone People’s Party and upstart candidate Kandeh Yumkella of the newly formed National Grand Coalition party, along with 13 lesser-known candidates. In Port Loko, a northern town, the APC enjoys wide support. On Saturday, party faithful waved red flags, blowing vuvuzelas and whistles at a rally, one of many that have drawn huge crowds. Pharmacist Al Haji Seidu Kamara says the current APC government has brought much needed infrastructure, which he'd like to see continue. "Electricity, for the past 20 years we never have light in Port Loko. We only used small solar lamp, but now we have electricity," he says. He says roads have been paved, and the government has also clamped down on counterfeit drugs. “We have seen a lot of improvement in our country,” says Kamara. Even so, Koroma’s government has been criticized for mishandling the deadly 2014 Ebola epidemic, and the government has been hit with corruption and financial mismanagement allegations. The International Monetary Fund has withdrawn some funding from the government. Andrew Raka, the electoral officer for Port Loko district, said preparations for the poll have gone smoothly. Ballot papers for the district’s 236,125 registered voters sit under armed guard in rooms where only Raka has the key. Outside the electoral commission headquarters, youth lined up to see if they had been selected for more than 4,000 temporary jobs to work at polling stations on Wednesday. 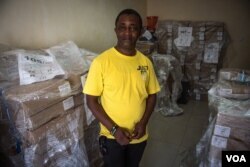 There's no shortage of people who need jobs in Sierra Leone, which is plagued by chronic youth unemployment, but Raka said he still needed to bring in staff from the capital Freetown due to lack of skilled workers. ​He said five percent of voters who tried to register in Port Loko had their registration affected by clerical errors made by staff, though some of these errors were fixed. 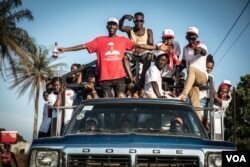 Campaigning across the country has been largely peaceful, reflecting the stability that has held in Sierra Leone since the end of a civil war more than 15 years ago. But Raka wouldn’t rule out the possibility of unrest. Already, Port Loko’s roundabouts are littered with smashed and torn billboards of various candidates, ripped down by their political opponents. “(Violence) could not be far fetched based on the tension I'm seeing going around the campaigning, and even some of the unacceptable things that are not really good for our country, especially people tearing other candidates' banners and posters, that one is just like a recipe for chaos,” Raka said. In the southern town of Bo, members of the opposition Sierra Leone People’s Party wear green hats, shirts, and pins in support of their presidential candidate, retired army general Julius Maada Bio. Bio once seized power in a coup before handing power to a civilian government, and lost the 2012 election to the current president. 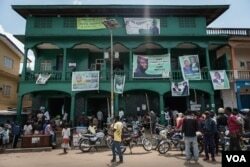 At the SLPP headquarters, youth leader Foday Abduli says he is confident that this time Bio will win. But Sierra Leone’s longstanding regional and ethnic political calculus may be changing. The NGC, led by former U.N. official Yumkella, only formed last year, but has made inroads in the backyards of the two major parties, which have dominated Sierra Leone politics since the 1960s. Preaching for better education and development, Yumkella has found support in urban areas and among youth like Luseni Aboucar, a 24-year-old college student who voted for SSLP's Bio in 2012. With so many presidential aspirants in the race, analysts predict no single candidate will receive the 55 percent of votes needed to win Wednesday’s poll, making a run-off very likely.